It’s an article about literate programming, Emacs, and Elasticsearch, if you couldn’t tell from the title. Check it out! Switching has been very nice, we run an SSL-enabled IRC server where we do all our of development chat and haven’t looked back at Skype (which we still use, but no longer for the majority of our development chatter). There are two types of commands, authorized and unauthorized commands (defcommand and defcommand* respectively). Authorized commands require the user to have sent the USER and NICK commannds as well as PASS (if required by the server). The bulk of the work in this command comes from helper functions that determine whether the message was sent to a room (room-for-name recipient) or a user (channel-for-nick recipient), then sends the command to the room or the specified user. Also of note are the hooks that are manually called (privmsg-room-hook and privmsg-nick-hook). This allows Subrosa to support plugins for additional features. Subrosa uses a custom in-memory database built around a ref to keep track of its users, channels and rooms. It acts like a key-value store for Clojure maps that allows for some interesting automatic indexing between fields. The database was previously built around clojure.contrib.datalog, but switched to a custom DB with the 0.7 version. Every time a user joins the server, a map is put in the DB mapping the Netty channel to the user’s nick (so that messages can be sent to that user’s nick). Rooms are also kept in the database to allow a message to be sent to each nick (therefore each channel) in a given room. Check out the tests for a quick look at how it’s used. This is exactly how the logging plugin works (and the /catchup command added in my fork of Subrosa). Automatic logging solves our first main problem with Skype, which is that it is difficult to get conversation logs if you aren’t involved in the chat from the beginning. That about wraps up a basic overview of Subrosa and how (some of) it works. I encourage you to check out the Subrosa github repo and peruse the code. Hopefully this may inspire you to use it as your own server, or fork the project on github and add more commands to it (it’s missing a lot of RFC commands still). Thanks (and pull requests) go to Dan Larkin for getting this project up and awesome (and for letting me write about it). I found out that at least 3 developers out of our group of about 11 use Dvorak. I had heard many people on the internet who had been using it before, but no one in real life. Having people you actually know using it did help in legitimizing the switch in my brain. Having switched to Emacs for Clojure development in order to pair with people at the new job, I started developing what has been known as “Emacs Pinky”. The pinky syndrome faded over time as I became more familiar with Emacs, but it made me think about RSI impacting me in the future. I decided that if I was going to change I would need to change while I was under 30. So far I feel like there has been less stress on my hands than Qwerty was. 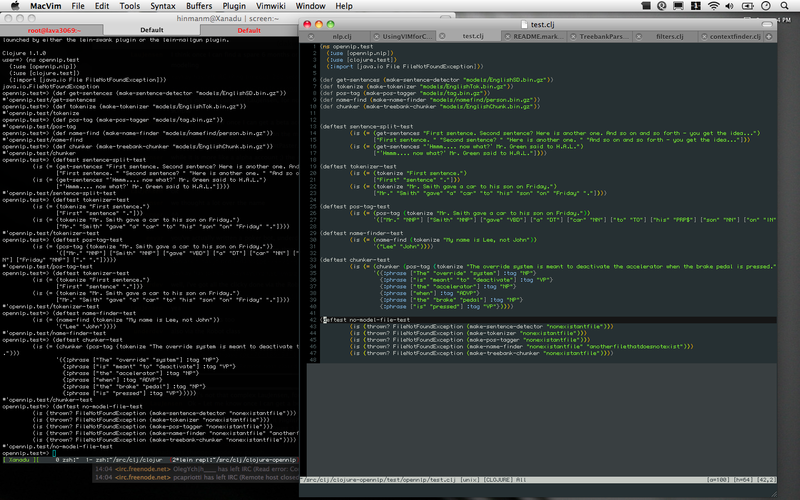 I also decided that if I was going to learn Emacs, I might as well gain the muscle-memory with Dvorak the first time. This has been great since I still have to think about Emacs commands, so only knowing the command with muscle-memory on Dvorak keeps my mind from Qwerty/Dvorak contention. Anyone that’s seen Phil type on his awesome keyboard pants knows how fast he types with Dvorak. It’s inspiring. So far, Dvorak has been really cool. I’m 2 weeks (and a day) into the switch. Right now my qwerty is completely shot, so I try very hard not to use it any more. I did a completely cold-turkey switch, which was hard at the beginning, but I’ve had some understanding coworkers that have helped it not be as painful (they would drive the pairing while I was just starting out). My speed with Dvorak right now is about 1/2 of my speed with Qwerty, but it gets better every day. The hardest letters to type so far are ‘q’, ‘l’ and ‘g’. I’ve also been having trouble with  being switched, I end up typing / every time I mean to type [ (like I said, getting better every day). Overall, I would still recommend to anyone that types a lot that if they can take the initial hit, it’s worth the switch. Switch cold-turkey – switching half time will leave you crazy. Try not to be in a position where people have to watch you type – if you think it’s painful to type, imagine watching you type. I was explaining some of the NLP stuff I’ve been working on to a teacher-friend of mine, and he suggested the idea of taking an essay a student had written, running it through a tokenizer and swapping the verbs and nouns with their synonyms. Would the essay still mean essentially the same thing? Would it still even be recognizable? It sounded reasonably easy to do in an afternoon, so I figured I’d give it a shot. I already had the tokenizing part, so I looked around and decided on Big Huge Thesaurus for their thesaurus API. About an hour of fooling around later, and Syndicate was born. It’s dead simple to use and provides hours minutes of amusement. To play with Syndicate, you’ll need to get an API key from Big Huge Thesaurus (they’re free). Google has lately set up itself on the receiving point in time of disapproval from seclusion and image somebody . But with two new creature , Google is trying to win over them that the social affair is on their opinion . On Tues , Google will set a new way called the transparentness news , at google .com/transparencyreport/ . It publishes where and when cyberspace give-and-take to Google parcel is blocked , and the block are annotated with info when possible . For natural event , the agency render that YouTube has been blocked in Iran since the disputed presidential selection in Gregorian calendar month 2009 . The ikon account will also be the location for Google 's politics subject matter creature , a representation that demonstrate every reading a politics has communicate Google to admit down or transfer over cognition , and what part of the moment search engine has complied . search engine introduced it in Gregorian calendar month and word it every six period of time . polity petition could be tribunal taxonomic category to vanish hateful contentedness or a judicial writ to go along along content about a Google mortal . The melodic theme is to ready transparence , and we 're cross that foil is a balk to security review , said Niki Fenwick , a search engine interpreter . That’s all there is to it, just an amusing library for playing with text in < 100 lines. In the future I’ll add a method to specify an API key without changing the source. I’ve been trying to get this working for quite some time, I finally have a semi-working function to fold Clojure methods automatically. That’s it, easy as pie, enjoy the folding for Clojure files. Does Clojure really need another set of introduction slides? Well, I guess it couldn’t hurt, I looked at quite a few when coming up with mine (I recently gave an ‘Introduction to Clojure’ tech talk to co-workers), so I figure they’ll be useful to someone in the future. I’ve also been testing the new 2.2 pre-release of VimClojure (actually using nailgun this time), and it is sweet so far. Recently Lau Jensen wrote a post talking about the features of Emacs and why it increases the productivity of Clojure programmers. While I don’t disagree that lisp programming in general benefits greatly from using Emacs as an editor, there are simply people who are too heavily invested into Vim (like myself) for things like viper-mode to work for them. 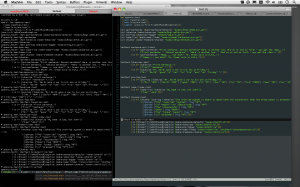 So, I thought I’d share how I do Clojure development with Vim. Throw in my 2 cents. The key (for me) to editing Clojure code in Vim is a combination of two plugins, VimClojure and slime.vim (see associated blog post). One of the difficult things is that slime.vim doesn’t actually exist anywhere on vim.org’s list of scripts, so it has to be downloaded from the aforementioned blog post. Stick it in the ~/.vim/plugins directory to install it. 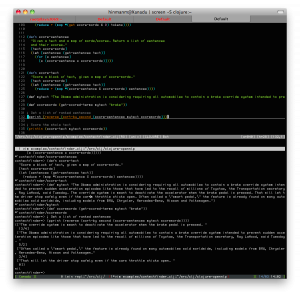 First, VimClojure. I tend not to use Nailgun at all, some people like it, I don’t. So instead of the regular install for vimclojure, I copy over the files from the autoload, doc, ftdetect, ftplugin, indent and syntax folders to their respective Vim folders. If you think you’ll want the Nailgun functionality, you should use the installation instructions provided by Kotarak. let g:clj_paren_rainbow=1 " Rainbow parentheses'! If you’ve used screen before (and I’m assuming you have), this is the window number your REPL is running on. After you enter this information the plugin will send the paragraph/line of text to the REPL. From here on the session id and window will be cached, so hitting ctrl+c,ctrl+c again will immediately send whatever function the cursor is on to the REPL. You can also select a block of code using visual mode and use ctrl+c,ctrl+c to send everything selected to the REPL. If you used the wrong numbers, use ctrl+c,v (Control+c, then v) to have slime.vim ask you for the numbers again. I know this doesn’t even come close to the amount of integration the Emacs has using SLIME, but for me, this is exactly what I want out of a Clojure development environment, develop some code and be able to easily send it to a REPL. 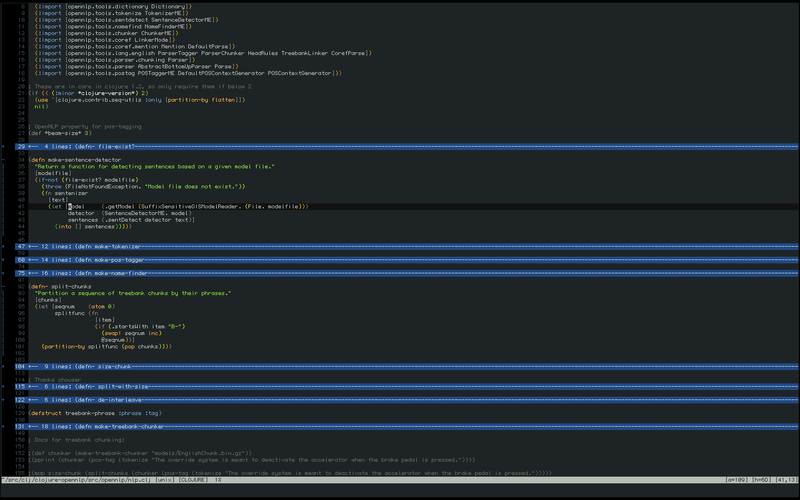 Hopefully a Vim user or two out there will find this setup useful. 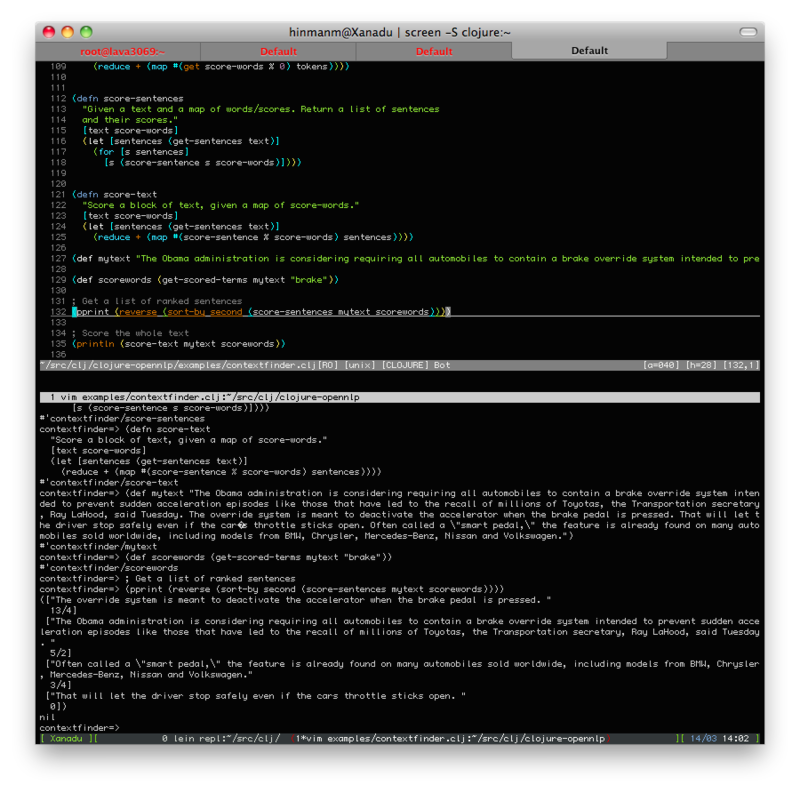 UPDATE: If you’re interested in my full Vim setup for some reason, you can check it out here. UPDATE 2: Want to automagically fold Clojure methods when using Vim? Check out this post. This is an addon to my previous post, “Natural Language Processing in Clojure with clojure-opennlp“. If you’re unfamiliar with NLP or the clojure-opennlp library, please read the previous post first. In that post, I told you I was going to use clojure-opennlp to enhance a searching engine, so, let’s start with the problem! I took this sentence out of a NYTimes article talking about the recent Toyota recalls, just pretend it’s an interesting sentence. Let’s say that you wanted to search for things containing the word “brake“; well, that’s easy for a computer to do right? But, let’s say you want to search for things around the word “brake“, wouldn’t that make the search better? You would be able to find a lot more articles/pages/books/whatever you might be interested in, instead of ones that only contained the word key word. Right. Well. That really isn’t helpful, it’s not like the words “when”, “the” or “is” are going to help us find other things related to this topic. We got lucky with “pedal”, that will definitely help find things that are interesting, but might not actually have the word brake in them. So next to each word, we can see what part of speech that word belongs to. Things starting with “NN” are nouns, things starting with “VB” are verbs. Doing this is non-trivial. (A full list of tags can be found here). That’s why there are software libraries written by people smarter than me for doing this sort of thing (*cough* opennlp *cough*). I’m just writing the Clojure wrappers for the library. The red next to each word indicates how heavily we’ll weight each word when we use it for subsequent searches. The score is divided by 2 for each unit of distance away from the original key term. Not perfect, but it works pretty well. That was pretty easy to follow, right? Now imagine having a large body of text, and a term. First you’d generate a list of key words from sentences directly containing the term, score them each and store them in a big map. On a second pass, you can start scoring each sentence by using the map of words => scores you’ve already built. In this way, you can then rank sentences, including those that don’t even contain the actual word you’ve searched for, but are still relevant to the original term. Now, my friend, you have context searching. Congratulations, that was a really long explanation. It ended up being a bit more like pseudocode, right? (or at least an idea of how to construct a program). Hopefully after understand the previous explanation, the code should be easy to read. The most important functions to check out are (score-words [term words]) method, which returns a list of vectors of words and their score, and the (get-scored-terms ) method, which returns a map of words as keys and scores as values for the entire text, given the initial term. I highlighted the score for each sentence in red, see how sentences such as the third in the list have a score, but don’t contain the word “brake”? Those would have been missed entirely without this kind of searching. Score a whole block of text, self-explanatory. Anyway, I’ve already spent hours writing the explanation for why you’d want to do this sort of searching, so I think I’ll save the explanation of the code for another post. Hopefully it’s clear enough to stand on its own. If you find this interesting, I encourage you to check out the clojure-opennlp bindings and start building other cool linguistic tools! NOTE: I am not a linguist, please feel free to correct me in the comments if I use the wrong term! Natural Language processing (NLP) is a field of computer science and linguistics concerned with the interactions between computers and human (natural) languages. Natural language generation systems convert information from computer databases into readable human language. Natural language understanding systems convert samples of human language into more formal representations such as parse trees or first-order logic structures that are easier for computer programs to manipulate. Many problems within NLP apply to both generation and understanding; for example, a computer must be able to model morphology (the structure of words) in order to understand an English sentence, and a model of morphology is also needed for producing a grammatically correct English sentence. Clojure-opennlp is a library to interface with the OpenNLP (Open Natural Language Processing) library of functions, which provide linguistic tools to perform on various blocks of text. Once a linguistic interpretation of text is possible, a lot of really interesting applications present themselves. Let’s jump right in! The (make-<whateverizer> "modelfile.bin.gz") functions return functions that perform the linguistic offering. I decided to have them return functions so multiple methods doing the same sort of action could be created with different model files (perhaps different language models and such) without having the pass the model file every time you wanted to process some text. You can check out a list of all the tags if you want to know what they stand for. Given a list of pos-tagged elements, return only the determiners in a list. Check out the filters.clj file for a full list of out-of-the-box filters. That’s about all there is in the library at the moment, so I hope that made sense. Unfortunately clojars.org does not provide a nice way to public documentation for a library, so the documentation in this post and on the github page will have to do for now. UPDATE: Hiredman has let me know that the jar on clojars is missing the 3 dependencies used for the library. I’m busy working on writing pom.xml’s for the jars so I can upload them to clojars as dependencies. In the meantime, make sure you have the 3 jars in the lib directory (of the github project) in your classpath. Feel free to report any other issues on the github tracker or in the comments. UPDATE 2: I fixed the project.clj file and pushed new versions of opennlp.jar and the dependency jars. A regular ‘lein deps’ should work now.